This lovely gift book/sympathy card will comfort members of any and every religion. Eight breathtaking images by artist Joe Paczkowski provide a tranquil backdrop for thirty-one short quotations from eight different major religions plus a dozen writers, poets and philosophers – all assuring us of the existence and beauty of the life to come. Use this as a sympathy card with the optional envelopes and signature cards, or order them as booklets without the envelopes to be given out by hospice workers, in hospital chapels and at funeral homes. Prices as low as $1.25 each without envelopes or $1.50 each with envelope and card. This lovely gift book/sympathy card will comfort members of any and every religion. Eight breathtaking images by artist Joe Paczkowski provide a tranquil backdrop for thirty-one short quotations from eight different major religions plus a dozen writers, poets and philosophers – all assuring us of the existence and beauty of the life to come. This collection will uplift the hearts and assure the souls of anyone who is grieving the loss of a loved one or contemplating their own journey into the next world. Use this as a sympathy card with the optional envelopes and signature cards, or order them as booklets without the envelopes to be given out by hospice workers, in hospital chapels and at funeral homes. I could write volumes about the beauty and versatility of this collection of images and quotations, but a few minutes looking at the interior pages will tell you all that you need to know. Just click on the image to enlarge it, then move your curser to find the arrows on the right edge of the picture. 6×6″ square, 16pg. on heavy matte paper. They are available with or without matching envelopes. The envelopes come in an assortment of light blues, silver and parchment. When you order these with envelopes, you also automatically receive an equal number of matching signature cards that say “In Memory of ___ From___” on the back. These are also available separately as MTC-AL. Scroll through the pictures to see what these look like. Note: In the USA, the weight and square shape means that in 2014 they require 91¢ postage when mailing. 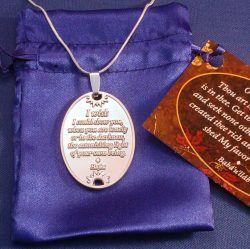 Our Memorial Pendant/coin makes a nice companion gift for those seeking a physical reminder of the constant presence of their loved ones. Note: If you represent a hospice, hospital or other institution and would like to receive a sample copy for review purposes, please contact us. If you have purchased one in the past, please feel free to leave a review.